As the Left ruled out supporting any no-confidence motion in the Lok Sabha against the Congress-led UPA government, Union Finance Minister P. Chidambaram said there was no threat to the coalition at the Centre either from the Left or the Right. Should strikes by pilots be banned? 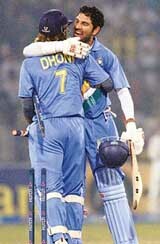 Dhoni was architect of the Indian victory. It was a pleasure watching the game. The Left parties assurance that they will not move or support a no-confidence motion against the UPA government in the coming Budget session of Parliament helped ease the tension in the ruling combine, but the Congress circles are unhappy with the “soft” handling of the Marxists. The Supreme Court today transferred to itself from the Delhi High Court writ petitions of all 10 MPs who had challenging their expulsion from Parliament before it in the “cash-for-query” scam. An order to this effect was passed by a Bench of Chief Justice Y.K. Sabharwal, Mr Justice C.K. Thakker and Mr Justice R.V. Raveendran. The per hectare yield of wheat has been falling in Punjab for the past five years. The state meets 60 per cent of the country’s total requirement of wheat. The major reason for the fall in the yield is said to be the rising temperature in this region. The Prime Minister’s Office has strongly denied its involvement with the work of Justice Rajinder Sachar Committee, which has been tasked with preparing a report on the social, economic and educational status of the Muslims. The stir by Air Sahara pilots entered its second day today, disrupting flights and leaving angry passengers stranded at airports across the country even as the management warned the staff of disciplinary action. A man incarcerated for 38 years in Faizabad in Uttar Pradesh without trial was today ordered to be released on bail by the Supreme Court, which had taken suo motu note of media reports about the plight of Jagjivan Ram Yadav held in a murder case in 1968.